When your friends take some black and white photos and share them to their social networks, are you wondering what filter app is applied? Indeed, quite a lot of camera apps are available on the smart phone which provide a great way to shoot pictures in different styles, such as vintage, bright, negative, darker, etc. But when it comes to making video black and white with colorful raw video footages, these apps are not applicable. We have to use video editing programs to change the video color. Keep reading the following to know more about the apps that are practical and useful. We all know Windows Movie Maker is a preinstalled editing program on the Windows platform. Its pretty basic interface is similar to other office programs with useful tabs enabling you to trim, crop, rotate, add captions or even apply visual effects to your project. 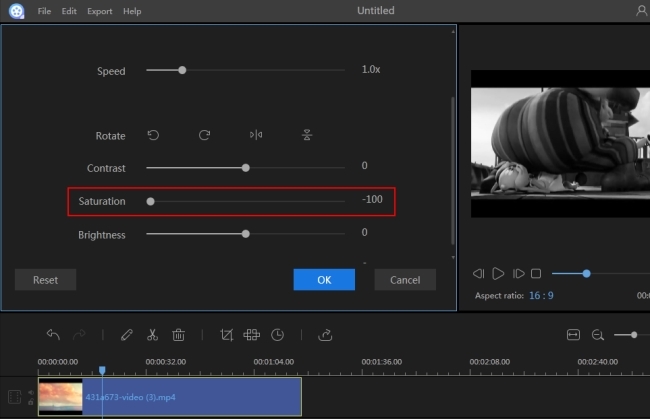 If you are not that good in running a computer and software, make Windows Movie Maker your first option to make video black and white. The usage of this app is as follow. Open the program, hit “Add videos and photos” to select the file you want to edit, and then go to “Visual Effects” > “Black and White”. The videos will be automatically converted to black and white. Click “File” > “Save movie” to save the file to your computer. 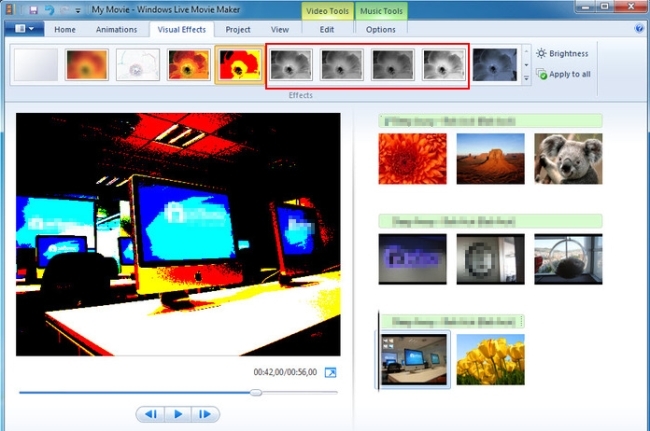 Easy to apply is one of the advantages of Windows Movie Maker, but the limitation is that it supports few video types and provides no other options to adjust the overall hue. Besides, Movie Maker often crashes and it supports very limited video types. Remember to save your file regularly when you have made changes to the video. 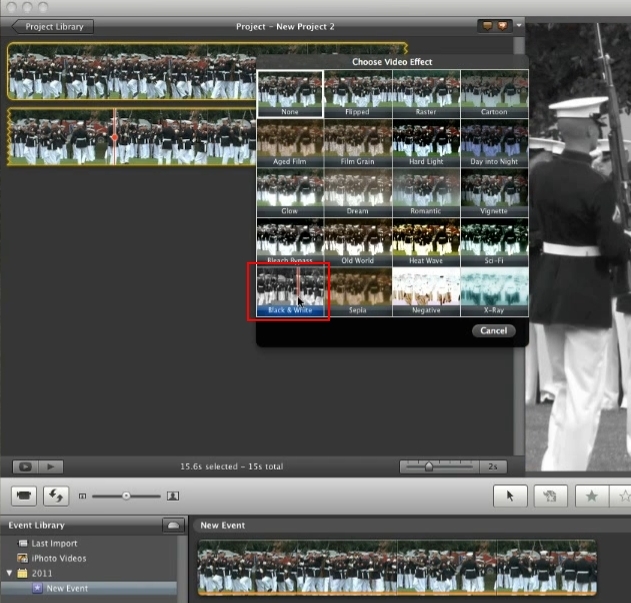 iMovie can be used as a black and white video maker which can let you apply the vintage effect to video on Mac. It includes a series of video effects to enhance videos. You can use a special filter to a clip to make it look like an old film. The usage is as follow. Click “File” > “Import” > “Movies” to import your video. Drag the file to the “Project” window, double click on the video, then a box will pop up, click on “Video Effect” and choose “White and Black”. ApowerEdit is also a choice to make video black and white. As a multifunctional video editor, it makes video editing easy and enjoying. 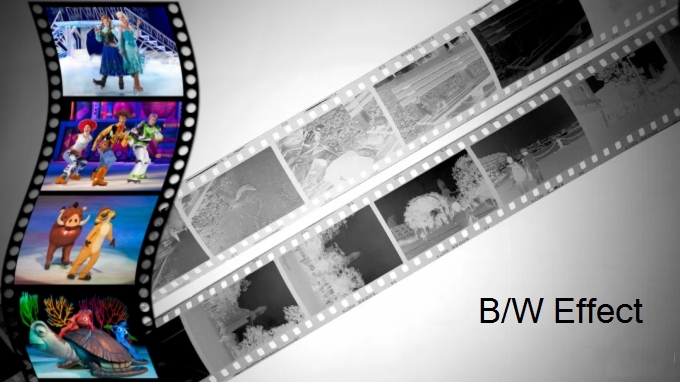 It allows you to create your own black and white movies with all kinds of videos, audios and images. There is no limit of it. The best of it is that you can take a control of the shading of your video like brightness, contrast, saturation, and hue, etc. You’ll find out many useful features out there if you follow the instructions below to make video black and white. Download and install ApowerEdit on your computer to try this program for free. Launch the program, click “Import” or drag files you want to edit to the main interface. Right click on the file and then choose “Add to project”. You can also drag and drop the file to the timeline. Select the clip or the range and hit the “Edit” button to bring out the window where we can apply the black and white effect. Click the “Export” button and choose the proper format to save the video. Black and white image leaves us a feeling of elegance to a picture or video. Old films and photographs frequently use this effect. Technically, black and white effect is not sharply contrasted with black and white. It combines black and white color to produce a range of shades of gray. The use of black and white in mass media usually indicates something that is nostalgic or historic. It’s difficult to find films that are shot in black and white now.